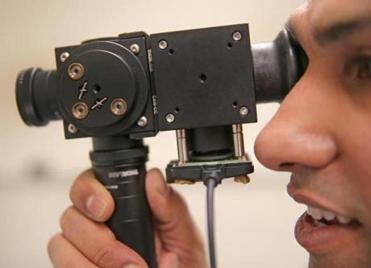 QuickSee takes photos of patients’ eyes and creates prescriptions for eyeglasses. Shivang Dave and his team of Massachusetts Institute of Technology students have what they hope is a $1 million idea, but it’s not a killer app or the next big thing in social media. Instead, its a way to improve eye care among the poor living in India’s urban slums by making it easier and more affordable to get eye exams. 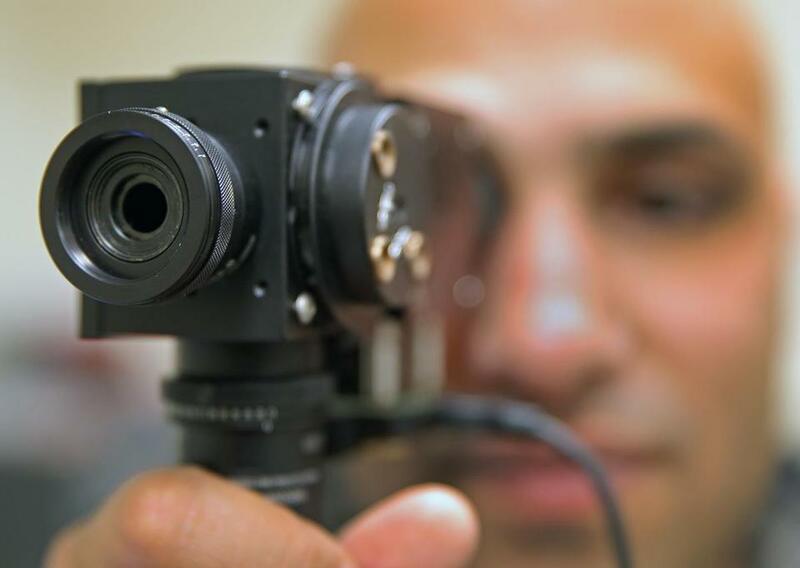 The team has developed a handheld camera, called QuickSee, that takes photos of patients’ eyes and automatically creates prescriptions for glasses — at a fraction of the of cost traditional exams. “Our device is cheaper, easier to use, and it’s portable,” said Dave, senior fellow at MIT’s M+Vision program, a collaboration in biomedical research between MIT and the Spanish city Madrid. Dave and his group are among 44 teams from universities in the Boston area and elsewhere that will compete in Cambridge Saturday in the regional finals of the $1 million Hult prize, which seeks to encourage students to launch social enterprises — businesses that seek social good as well as commercial success. Shivang Dave and his MIT team say QuickSee is cheaper and easier to use than traditional diagnostic methods. Financed by the family of Bertil Hult, the founder of EF Education First, the four-year-old contest has launched social enterprises taking on some of world’s most pressing issues, from education to poverty to food shortages. Each year, the business plan competition focuses on a particular challenge, and this year, working with Clinton Global Initiative, a program of former President Bill Clinton’s foundation, it will focus on health care in poor cities. The winners of the six regional contests held around the world this weekend will compete in New York in September for the $1 million to jump-start their social enterprise, making pitches to Clinton and other judges. Last year’s winners, a team from McGill University in Montreal, used the money to launch Microlivestock, which has built a facility in Mexico to breed grasshoppers as a way to address the global food shortages. The McGill team proposed raising insects as a cheap, sustainable way to provide protein without the intense land use and environmental impact of livestock farming. “There is a need for business to solve these problems,” said Mohammed Ashour, who led the McGill team. In this year’s competition, each team will present a business plan for a social enterprise to improve health care in some of the poorest, most underserved parts of the world. The ideas range from MIT’s QuickSee to new wound treatments to kiosks allow people to self diagnose. A Harvard University group is proposing a way to make health screenings more accessible to the poor residents of India’s cities. They have designed a pedicab-like medical cart that will carry medical tools such as blood pressure monitors and blood test kits to check sugar, cholesterol, and provide other basic health services. Specially trained technicians will operate the carts and refer patients considered at risk of serious medical problems, such as heart attacks, to a hospital. Irfan Alam, a student at Harvard’s John F. Kennedy School of Government and a member of the five-person team, said the group’s business plan has three options for supporting the carts: Indian government funding, advertising by pharmaceutical companies, or low-cost memberships. A Boston University team, meanwhile, wants to harness computing power to address respiratory ailments in the slums of Mynamar. The idea is to use mobile devices to compile information from those suffering from respiratory diseases, including height and weight, as well as which treatments work for their conditions. The team will then feed that data into computers to analyze and help develop diagnostic and treatment methods. “We are ready to roll up our sleeves and get in there to do it,” said Kimberly Principe. The Hult Prize was conceived in 2009 by Ahmad Ashkar, then a student at Hult International School of Business in Cambridge, an affiliate of EF Education First, which also has its North American headquarters in Cambridge. While sitting in class, he said, he realized that the business practices he was studying could be used to address social issues. He launched the competition that year. In 2011, the Hult family began funding the prize. This year, 10,800 students from 150 countries entered the competition. The estimated 1,200 regional finalists were selected through competitions at their schools or reviews by Hult Prize judges. In addition to a trip to New York, the regional winners will participate this summer in a seven-week accelerator program in Cambridge, a sort of boot camp for entrepreneurs. There, the teams will work on their pitches, learn from mentors, and hone their business plans.